There are 79 Assisted Living Facilities in the Sanford area, with 7 in Sanford and 72 nearby. The average cost of assisted living in Sanford is $2,925 per month. This is lower than the national median of $3,346. Cheaper nearby regions include Longwood with an average starting cost of $2,481. To help you with your search, browse the 513 reviews below for assisted living facilities in Sanford. On average, consumers rate assisted living in Sanford 4.1 out of 5 stars. Better rated regions include Longwood with an average rating of 4.3 out of 5 stars. Caring.com has helped 14 families in Sanford find high-quality senior care. To speak with one of our Family Advisors about assisted living options and costs in Sanford, call (855) 863-8283. Known as the "Historic Waterfront Gateway City," Sanford, Florida, is on the southern shore of Lake Monroe and features a downtown river walk where seniors can peruse antique and collectible shops before heading home to one of seven assisted living facilities in Sanford or one of 50 in nearby Lake Mary, Deland and other Orlando-area towns. Florida’s Department of Elder Affairs oversees the state’s many assisted living facilities, or ALFs. The state defines an ALF as any licensed residential care facility that provides food, personal care and other supportive services. Thanks to its location in central Florida, Sanford boasts warm temperatures throughout the year. Winter months feature comfortable highs in the 70s. However, temperatures and humidity levels soar in the summer months, when average high temps exceed 90 degrees from June through September. Living in Sanford is slightly cheaper than the Florida and U.S. average with housing costs about 15 percent lower than the state average and 17 percent below the national average. Crime is a concern in Sanford. The city is safer than just 4 percent of U.S. cities. Violent crime rates are twice as high as the state average. Likewise, property crime rates in Sanford are higher than other Florida cities. Orlando’s Lynx public transportation system reaches Sanford as well. This system includes fixed-route buses as well as Access Lynx, a valuable asset for seniors. Access Lynx is a shared door-to-door service available to individuals with a disability or other limitations. The Sanford area is home to world-class medical facilities, including Central Florida Regional Hospital, in the event of medical emergencies or illness. Sanford has an array of community resources for seniors, including the Golden Age Games, the nation’s oldest senior games competition as well as one senior center. Assisted Living costs in Sanford start around $2,925 per month on average, while the nationwide average cost of assisted living is $4,000 per month, according to the latest figures from Genworth’s Cost of Care Survey. It’s important to note that assisted living rates in Sanford and the surrounding suburbs can vary widely based on factors such as location, the level of care needed, apartment size and the types of amenities offered at each community. 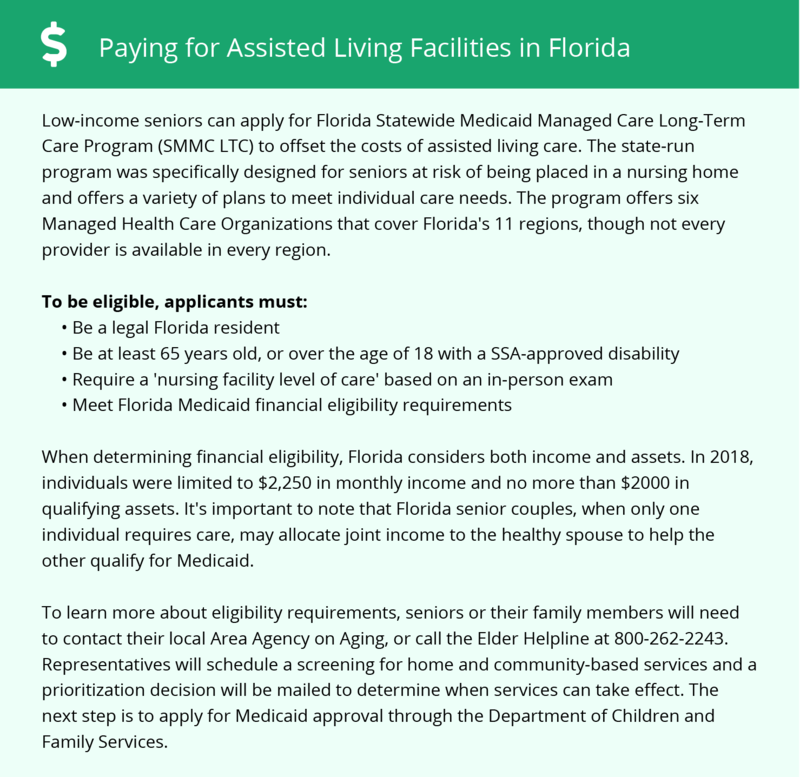 Eligible seniors in Sanford can apply for two state programs. The need-based Optional State Supplementation program provides extra income that seniors can use toward room and board at an assisted living facility. Two other programs, Medicaid Long-Term Care and Assistive Care Services, can help low-income seniors with the cost of services as ALFs. Sanford and the surrounding area are home to numerous government agencies and non-profit organizations offering help for seniors searching for or currently residing in an assisted living community. These organizations can also provide assistance in a number of other eldercare services such as geriatric care management, elder law advice, estate planning, finding home care and health and wellness programs. To see a list of free assisted living resources in Sanford, please visit our Assisted Living in Florida page. Sanford-area assisted living communities must adhere to the comprehensive set of state laws and regulations that all assisted living communities in Florida are required to follow. Visit our Assisted Living in Florida page for more information about these laws.